Street sparring, 14oz boxing gloves. Practising what we preach since 2005, tested and proven to work in real life. A unique mix of tactical fitness training, MMA and Defendu. Lessons cover the following areas. Fit to fight? Get real about your current fitness and stamina to win in a real fight. 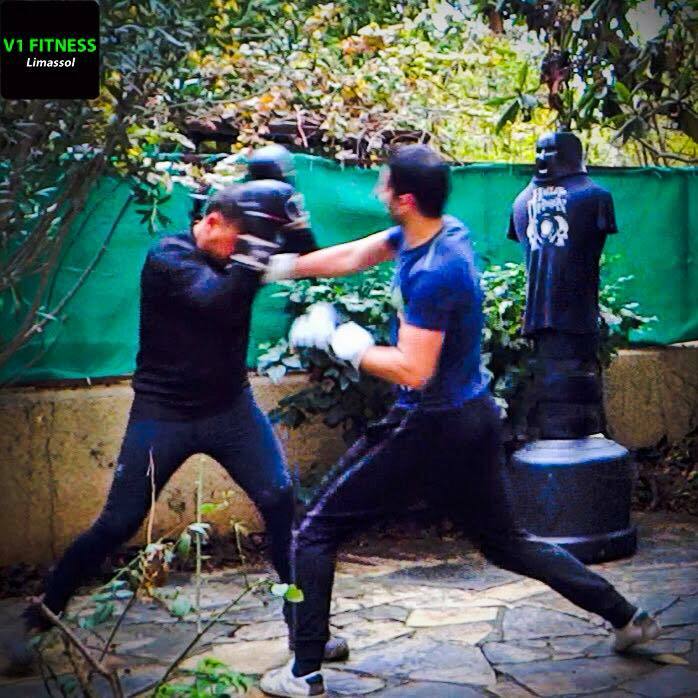 V1 Tactical Fitness workouts are a major component of our self defence training for men. Learn self defence as you get warrior fit. You won't need any other gym membership when you start our combative self defence lessons! Learn how to deal with any size opponent in real life situations, at work, while driving (road rage), home intruders. Learn how to practice daily the awareness system as used by police, military worldwide. Ground fighting to win, it's not a sport! Be safer at night when out in Limassol, or anywhere in the world with realistic self defence training that ANYONE can master in 10 weeks. You don't need a black belt for self-defence on the street, you need simple PROVEN techniques that have been trained to instinctively take effect when faced with a fight or flight situation. Learn how to deal with a knife attack and survive. Become your own bodyguard with tactical awareness training for Cyprus, as well as international travel. Emergency preparedness survival training for social chaos, man-made and natural disaster scenarios. Learn how to protect yourself and your family in real life situations you may actually face in reality today, tomorrow, next week. Home invasion self-defence training for you and your family members. Fighting with a heavy stick or club. V1 FITNESS self defence programme is simple to learn and very brutal in its application. Designed to give you the highest percentage of surviving a REAL FIGHT self-defence situation. If you are looking for 'cool moves' to impress your friends, find a martial arts class. If you're looking for a no B.S., KILL OR BE KILLED COMBAT SELF-DEFENCE, this is it. Full contact ground and pound available. PROFESSIONAL SAFE TRAINING - Despite the nature of the training, we maintain a 100% zero client injury record since opening in Limassol, January 2011. Recommended trousers for V1 FITNESS combative training. Recommended boxing gloves, Must be 14oz weight. Recommended grappling gloves. Must have thumb protection.